If you’ve seen the movie, you’ll remember this scene. Anton Ego, the acidic food critic, is sitting alone in a restaurant. The kitchen doors open and out comes Alfredo Linguini on roller skates. He sets a wonderfully plated masterpiece on the table. Anton takes the first bite. The camera zooms in on his eyes. Flashback to Anton as a child, standing in the door, scraped up from playing. His mother serves him a steaming bowl of Ratatouille. All is well. Back to the present and Anton drops his pen, review forgotten. He digs in with abandon. 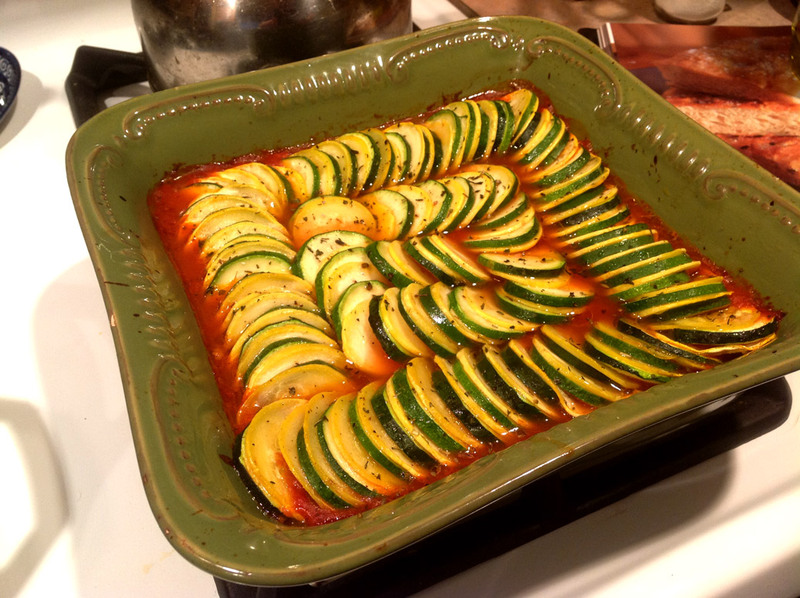 That scene has stuck in my mind for years, and last week, I decided to make Ratatouille as inspired by the movie. I found our mandolin, a wedding present from Mike Ricci, and started shaving zucchini and yellow squash. These thin slices go onto a bed of Piperade, a sort of red pepper infused tomato sauce. I made mine decidedly less vegan by adding a bit of spicy Italian sausage. Then, all this gets covered with some parchment paper and into the oven it goes! When it was finished, we served it with some homemade focaccia that Rachel made. The result? Fantastic. The texture of squash usually puts me off, but here the pieces are thin enough that they act only as flavor conduits. The sauce is a perfect blend of tomato and pepper, with just the right amount of heat from the spicy sausage. How does this tie into writing? 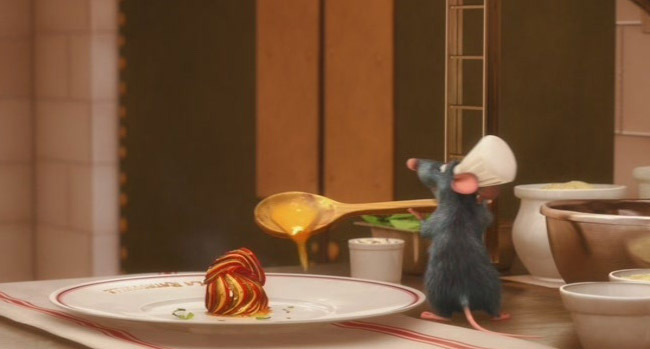 Well, Ratatouille so effectively used taste within the story that years later I remember this scene, and was even inspired to make my own version. I’d love for my stories to have that kind of impact. Ratatouille is a reminder not to neglect the sense of taste in our stories. We can’t convey the visual impact of food quite like the movies can, but we can do them one better by getting inside the character’s mind and describing the sensations. The pleasant burn of red wine as two friends sit and talk. The saltiness of sweat on a battlefield. The subtle bitterness of poison in a meal. Great observations, Josh. Thanks for sharing!